Despite the fact that the available carbon budget continues to diminish, fossil fuel companies remain on the lookout for new reserves around the world, blatantly disregarding public and governmental efforts to curb climate change. Our research has revealed fifteen of Australia’s biggest fossil fuel companies spent $12.7 billion exploring for more fossil fuels from July 2012 to June 2016. Just ten foreign companies spent a further $14.6 billion on fossil fuel exploration in Australia between 2013 and 2015. What’s worse, half of these companies are encouraging exploration through executive remuneration, and super funds are voting – with your retirement savings – to keep paying these dirty bonuses. Read more about the research and take action here. The great threat is that, with the sustained push to discover and extract more fossil fuels, their availability as sources of energy will mean that they are used to an extent that causes catastrophic global warming. 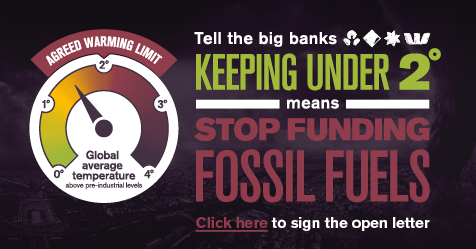 Read through the sections on this page to find out more about the dangers posed by rampant fossil fuel industries and take action against the banks and super funds that continue to support them. As an example, we can look at the threat posed by new coal mining in Australia. Adani’s proposed development of a gigantic coal mine in Queensland’s untapped Galilee Basin could see the extraction of some 60 million tonnes of coal per year, twice the output of Australia’s current largest coal mine. Along with the massive costs the mine would inherently imposes on the carbon budget, the Galilee Basin expansion will also see the destruction of thousands of hectares of land, as well as major infrastructure works. Worryingly, the works planned to support the new mine include the expansion of the Abbot Point coal port, which will see further irreparable damage done to the fragile Great Barrier Reef. The continued expansion and development of unconventional gas projects both internationally and here in Australia pose terrific dangers to local environments, as well as their obvious climate consequences. In NSW, energy giants AGL were forced to abandon coal seam gas (CSG) plans in the face of incredibly strong and sustained opposition from concerned local resident groups and environmentalists. However, there are a number of ongoing and planned projects, particularly in Queensland. 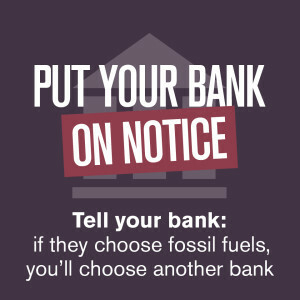 If you have an account with one of the big four Australian banks, let them know that you don’t want your money being used to support unconventional gas projects by putting them on notice. In addition to these Australia-specific issues, continued exploration and development of fossil fuel reserves internationally also pose huge climate and environmental risks. In India, the first budget under the Modi government included particularly worrying announcements of plans for a number of new coal-powered Ultra Mega Power Projects to be built. India’s coal minister also voiced intentions to triple internal coal mining to 1.5b tonnes per annum. While global demand for coal continues to wane, the huge scale of India’s power requirements make it one of the few countries in the world that could turn this trend around. Indonesia also poses a risk of massive increases in future coal consumption. The nation, which is currently the world’s largest exporter of coal, has flagged plans to triple its use of local coal over the next ten years, seemingly completely disregarding the country’s aim to cut CO2 emissions by 26% by 2020. In the US President Barack Obama used his powers to veto the proposed Keystone XL oil pipeline, which would have seen some of the most energy intensive oil on the planet being pumped from tar sands in Canada into the States. While the presidential veto is a handy roadblock to the project, Republican pressure and a fast-approaching election will ensure that the issue won’t go away. Is your bank lending to fossil fuels?